We have been serving OEMs for 14 years. A full service product design bureau, Invention House can provide conceptualizing, prototyping, hardware, software, human interface, and solutions. We can test your existing product and new designs in our 4,000 sq-ft St. Louis lab. Our specialty is energy related devices: motor controls, solar energy, wind power, and efficient HVAC. We have designed and built power converters as small as 2 watts and as large a 200 Kilowatts. Out of the box thinking is our strong suit. Bring us your needs and we will design a solution. We offer a full line of off-the-shelf motor drives and specialty drives for military, harsh ambient, single phase, etc. We can simplify your system by incorporating advanced functions into many of our drives. We can customize products to suit your requirements by incorporating power supplies, relays, and the PLC into the drive. Get Invention House on your side today! Phil and his team did an amazing job conceptualizing, designing and prototyping our power control system - custom 60kW inverter, PWM motor controller, and logic controller. He demonstrated the highest level of integrity, professional expertise and service on our project. 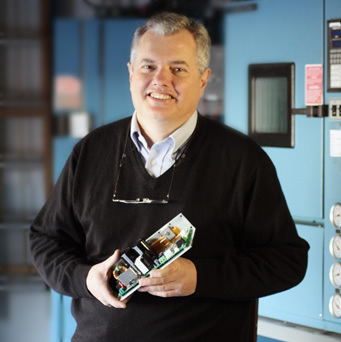 Phil Langhorst is a veteran of the motor control industry. After graduating from the University of Missouri - Rolla, Phil lead the development teams at Delco, Emerson Electric, and Magnetek. In addition to designing conventional induction motor drives, Phil designed one the the first drives for EC motors used in the HVAC market. In 2001, Phil founded Invention House to pursue his passion for building motor control circuits and other electronic devices. Invention House now serves OEMs, industrial clients and the US Military with a variety of custom variable frequency drive solutions. Phil holds several patents and is the author of "The simple truth about motor and drive capability" which explains how drives can effect motor reliability.